I had a strange dream last night that I was in a pub meeting someone that I knew from school, as the night wore on dozens of other old school ‘friends’ arrived, people I’d not seen for well over 30 years. Each of them had been nicely aged by my brain but were still vaguely recognisable and I even remembered their names! Even now several hours later I can remember a few of them and I searched on Facebook and LinkedIn to see if I could find them, about half of them turned up. Unfortunately my extrapolation of their 18 year old faces had been rather kind to them, they looked much more worse for wear in real life. The rest, sadly, were nowhere to be found. The dream made me quite nostalgic for my school days, but after looking at the real life people on LinkedIn I realised that they were strangers now, no loss, although I would like to know how everyone got on in life. 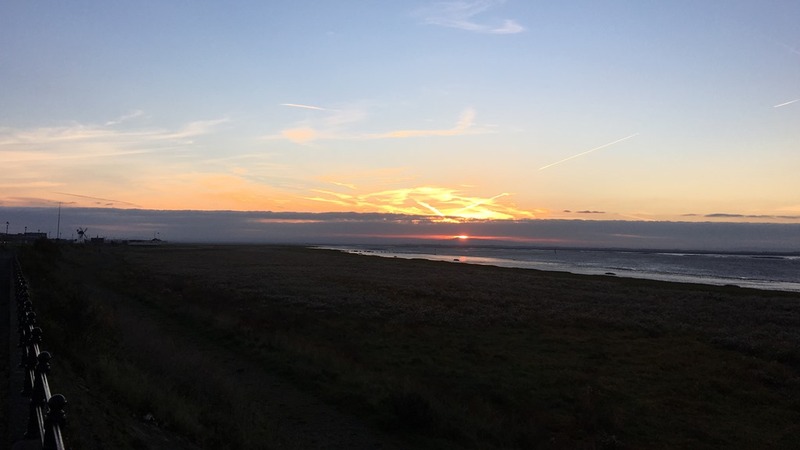 Despite the slightly disturbed nights sleep I was up bright and early, in time to get to Lytham Caffe Nero just as it was opening and enjoy the sunrise enroute (see photo). I tapped away on my laptop for a couple of hours and did some reading, and then met up with Debbie for breakfast at Lytham kitchen, which was a real treat. We then went for a long walk with her collecting leaves and fir cones for school and me telling her about my trip to London with Anna. Debbie then took my bag and coat home in the car, which made for a much more enjoyable ride home, I really should get some panniers for my bike that will take my rucksack. During the afternoon I finally made the first of my raised bed netting frames, which worked out perfectly, hopefully I will get the next two done tomorrow and have the netting attached by Thursday, Lewis helped me do the assembly which was lucky as it’s a fiddly job to do on my own. A job well done, I then watched an episode of Limitless and started to watch the Stargate film trilogy and did some reading before going out to Toby’s for a meal with Debbie, Jennie and Jon. The focus for the meal was budget talk, how Jennie and Jon are going to make ends meet and I’m confident that they will be fine. While browsing on LinkedIn I noticed that my brother (Shawn) had been promoted to VP of Sales for the mobile division of Mobica, nice, it’s a strange little company though lot’s of great technical expertise, but no products of their own, just lots of projects for others, I hope he’s enjoying it.